Alfredo Maraver graduated from Caracas’s Escuela de Artes Plásticas y Aplicadas in 1945. He participated in the activities of the Taller de Arte Libre and in several national Salones. Inspired by the commotion created in France by the group Los Disidentes and its magazine, he traveled to Paris in 1950, studied at the Académie de la Grande Chaumière, and attended the workshops of Edgar Pillet, Jean Dewasne, and Osip Zadkine. 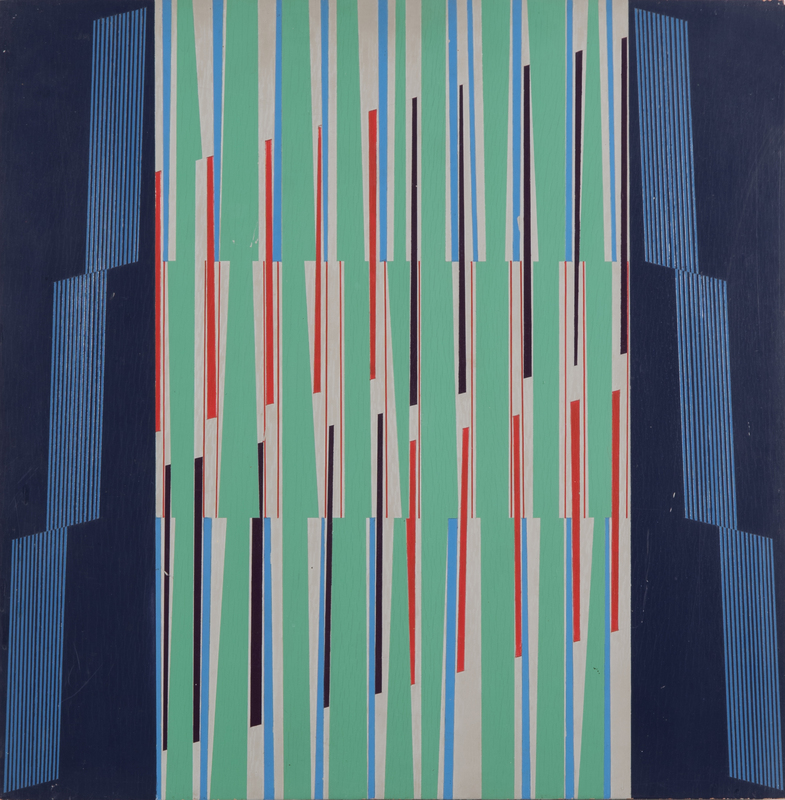 In the French capital, his early explorations of constructivism and the possibilities of color established him a pioneer of geometric abstraction in Venezuelan art. He returned to Venezuela in 1955, where he worked in the area of advertising and joined the group Sardio. He continued developing his painting, already centered on investigation in kinetic movement and produced abstract sculpture. Although he participated in numerous collective exhibitions, he mainly focused on teaching. Towards the 1960s, Maraver began to experiment with the retinal effects of compositions of lines and monochrome forms. In 1969, at the suggestion of a group of friends, he presented a retrospective exhibition Persistencia de una idea 1950-1968 (Galería del Banco Nacional de Ahorro y Préstamo, Caracas). During the mid 1970s, Maraver produced works in which the reflection of light became the main kinetic agent. Constructed primarily by superimposing supports (metal sheets on wood), incorporating metallic geometric fragments and other reflecting materials, and arranging them in series to reinforce the retinal effects produced by the reflection of light, these works formed the series Movimiento ondulatorio and Movimiento ondulatorio en reflejo. Maraver participated in several international group exhibitions, such as 29th Salon des Réalités Nouvelles (Paris, 1974) and Arte constructivo venezolano (Bogota, 1980). In 1981, he received the Premio Municipal de Artes Plásticas. In his second solo exhibition (Galería Graphic CB2, Caracas, 1997), he displayed an anthology of his work of the 1960s and 1980s.